The fading scroller is a great way to have text on your site that fades in then fades out. The width and height can be customized to any width or height you may require. Border width, color and background color can also be changed in the code, see how to change it below. If you would like to use the fading scroller copy the code above to your site. Its very easy to edit and hyper-links will also work in the content. This is your regular fading scroller, except in IE5+ and NS6+, the messages are gradually faded into view! Check out the technique used to accomplish the fading dynamically altering the texts color. Fade from any color you would like. The fading scroller width and height can be changed. Change text font and size to any thing you want. Change the border width and color. Links inside messages can also be set to fade, or remain their original color. The fading scroller code is a nice way to catch your visitors attention with short snippets of content about a page and you can have a hyper-link so if they want to know more they can click the link. Have as many short snippets of content you want fading in then fading out, the fading scroller will display them all one at a time. Your text will fade in then out and new text will fade in and so on. Once done it will start from the beginning again. 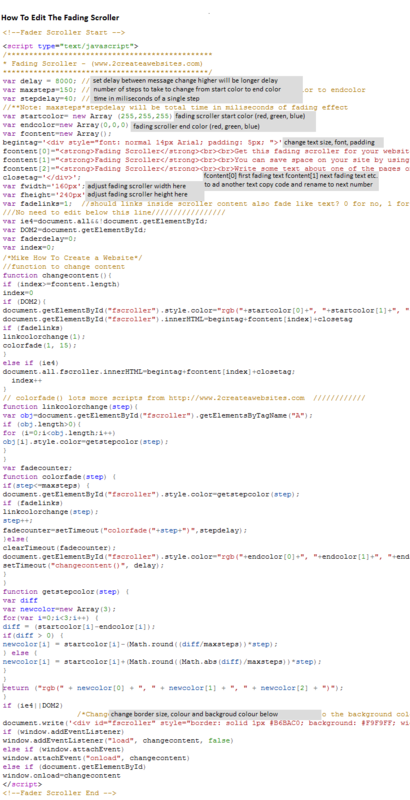 Its a nice way to have additional text on your page when you build a website.